Snapdragon powered smartphones are rare among the local device manufacturers in Bangladesh so whenever any such device gets released, there is usually a lot of hype. We got many messages and comments asking where in the world the review of the Walton Primo VX therefore without much ado, let us take a look at the device! The Primo VX may remind you of some previous Walton devices but it has certain design elements that help differentiate it from the rest of the pack. Starting off with the sides, there are metal plates on either side adorned by metal volume and power buttons. The power button has a nice bronze coloured rim which makes it stand out from the overall black coloured device. The power button is also clicky however the volume buttons are not. Regardless, they are all very responsive. The VX has a slim 7.3mm profile and weighs in at only 120 grams. This makes the device easy to use with one hand. The device is not slippery and is easy to grip so users need not worry about it sliding out of pockets. The back of the device is plastic and non-removable. It has a matte texture and is not prone to fingerprints. Although the back is sealed, there is a tray for a microSD card. The speaker is positioned on the back as well. The speaker does not get very loud and can be difficult to hear in noisy environments. Surprisingly, there is no support for USB OTG. This was quite strange given that almost every Walton device has this feature. The VX comes with Android 5.1.1 Lollipop and has support for OTA (Over The Air) updates. Walton uses Trebuchet launcher instead of the stock Lollipop launcher on the device. Trebuchet works very well and looks nice aesthetically. There are many customizations that can be made within the launcher making it quite feature rich. The lockscreen is not stock and for some odd reason it can not be disabled. I personally prefer to change up my lockscreen from time to time using various applications but since the lockscreen can not be disabled, I had to unlock my phone twice if I wanted to use a third party app. Another point to mention is that the lock screen tends to skip frames and therefore often looks jittery. The notifications tray and setting on the other hand are stock Android. Walton has included some nice features in the device such as the ability to dedicate certain tasks to the capacitive keys by using long and short presses. For example, I set the phone to go to sleep upon double tapping the home button. These features work very well and I ended up suing them throughout the review on a regular basis. A unique addition to the device is the pedometer. 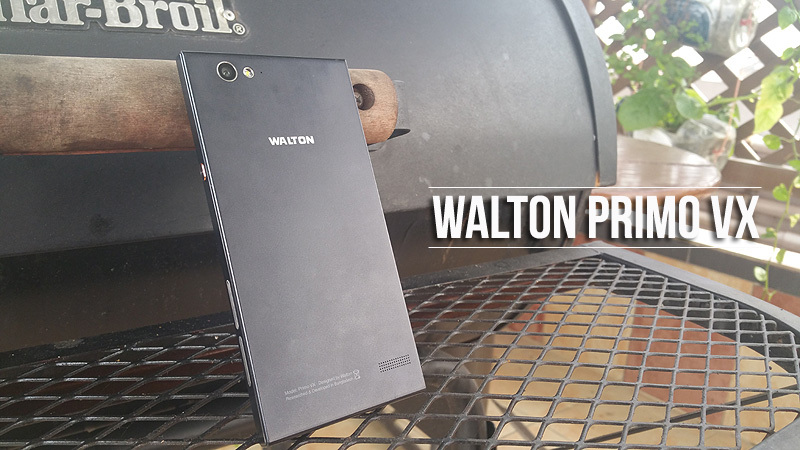 Usually we do not see local smartphones ship with a built in dedicated pedometer but Walton is looking to change that. Fitness and health bonuses have become key features of modern day smartphones and Walton has embraced that trend. The pedometer shows the number of steps taken as well as calories burned. A handy graph displays your activity over the week. The pedometer itself is quite accurate although I observed some inaccuracy when climbing stairs. The display is one of the highpoints of the Primo VX. It is a 1080p (Full HD) Quantum Sharp Pure Black IPS display with a pixel density of 441 pixels per inch. The display is pretty awesome and everything looks nice and crisp with the high resolution. Colour reproduction too is quite good although sometimes pictures look a little blue or yellow. Viewing angles are great but outdoor visibility is lacklustre. We could not shoot segments of the review outdoors because the brightness did not get high enough. The screen does dim quite a lot and is hence comfortable to use in the dark and does not hurt the eyes. The screen is protected by Gorilla Glass 3 and should offer the user some peace of mind. Regardless, the VX comes with a screen protector which we recommend using in case. The main hype surrounding the Primo VX was because of the octa-core 64-bit Snapdragon 615 processor. The Snapdragon 615 is a very popular chip and going into the review, we knew exactly what to expect. The processor is backed by 2GB RAM, an Adreno 405 GPU and 16GB ROM. Gaming on the device was great and we only noticed lag when playing Modern Combat 5 at high settings. During intense gameplay, the device does get slightly warm but not to an alarming degree. The benefit of having the Snapdragon 615 is that consumers know exactly what to expect from the chip. It is a processor that can do some impressive heavy lifting but won’t cost a fortune. The Primo VX has a non removable 2,300mAh battery which got me through a full day of use. Most days would end with about 10% left in the tank so on longer days, you might want to consider recharging at some point. If perhaps you forget to plug in the device at night, the VX will not get you through the next day. Instead of beating about the bush, I will get straight to the point. The main camera on the VX is the best 13 megapixel unit I have used on a Walton device. I believe the reason behind this is the different image processing as we have the Snapdragon camera application instead of a stock one. The main camera is a BSI sensor sporting an f2.0 aperture therefore allowing for some nice low light imaging. The shutter is fairly quick although shooting in HDR takes some time. The results yielded by HDR mode are quite impressive when compared to auto mode. The Walton Primo VX is a very capable device. Although it is missing OTG and has a non-removable battery, the device ticks most of the right boxes when it comes to appeal and performance. The battery life could have been better but it is a sacrifice that must be made for the excellent 1080p display. At Tk/- 17,999 the VX offers buyers a great performing package with a few extra perks in the form of the pedometer and better image processing. If you’re looking for something in this price range, the Primo VX is definitely a candidate to consider. Check out the video review to see the device in action!